Thank you Channa for posting this video. 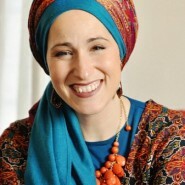 I found a treasure on Youtube with shiurim an other posts of Rivka Malka, very nice! very inspiring. but what happened to the baby??? rushed to the NICU, what did she have? is all okay?. thanks! this is beautiful and I was very moved. But I have to say the more I listened to her, the more I thought – it’s wonderful that she’s changed so much through this story, but she’s not saying anything new really. Maybe because she grew up frum and nothing ever really opened her eyes before, but what she’s saying was pretty basic. Hashem loves us and everything we do is through those eyes.. that’s basic Judaism and how we should all feel all the time. It’s sad that she had to go through something so horrible to come to this revelation. Sometimes theres a difference between knowing H’ (head knowledge) and KNOWING H’ (with your being)… that kind of translation doesn’t really carry over into words. So generally it can sound simple. H’ allowed Himself to be shown to her through this and I can understand that she was changed. It’s the beauty of H’ being the Adon Olam… there’s always so much more to discover B”H. Although we know Hashem loves us, yet, sometimes when we go through a great difficulty or emergency, and we see His help – we actually realize His loving care over us in a deeper way. His help in the midst of trauma can take us to new heights in our emunah. After Hagar fled from Sarah and was found – she said, “You are the G-d Who sees”. Maybe Rivka now says, “You are the G-d Who heals”. May each new day bring us to a deeper realization of who He really is. I don’t know about all of you but I definitely DON’T feel this way all the time. I wish I did and I work every day to do so but at least for me to constantly feel that Hashem loves me and see everything through those eyes, however basic that is supposed to be, is not something I can just do. It is great if some women can but I would guess that for most of us Hashem often feels far away or hidden. Partly this is probably because we are safe and have so much and take so many miracles for granted (health, food, shelter, our senses, conceiving children, carrying to term, having a spouse, safety, healthy children etc), and it is only at times of distress or danger that we get that clarity. true. but we need to strive to have this realization so that we don’t need to go through a trauma to understand this concept. Thank you Ilana, for posting the link. I read the article and two points jumped out. One was that she understood that Hashem’s love for us is acceptance of us as we really are, not the critical voice we have inside our heads. amazing news! rivka malka is going to make a video addressing this question! Yes, interesting that she noted another woman in the community that went through the same thing and was left in a vegetative state. How would Rivka explain this to this woman’s children and husband through the lens of Hashems love? How do we feel love when we are suffering… I look forward to hearing her thoughts.